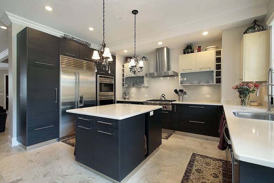 While most consider the kitchen to be the heart of the home, it may be more aptly described as the nerve center. Serving a number of important functions from meal preparation to gathering space. This multipurpose room is easily one of the most used in any home and one where the decor, ambiance, and level of organization can set the tone from the rest of your living area. The right window shades and organizational techniques can help your kitchen run at peak performance, making meal preparation a breeze, and leaving you more time to enjoy your friends and family. Here are five steps you can take to help get you started. Step 1: Start from scratch. Clear off counter and floor space, and begin emptying your cupboards one at a time. As you touch each item you remove, make a decision on whether to keep, donate, or discard it, based on criteria such as condition, usability, and duplication. Designate areas within the room, with boxes for donation, bags or bins for garbage and recycling, and counter or floor space for items you use and love. Step 2: Make order from chaos. Once you've emptied all your cabinets, remove the items you're discarding or donating, to give yourself more space to work in. Begin sorting the remaining items in to piles which make sense to you, such as seasonal items, baking tools, cookware, and utensils. Step 3: Formulate a plan. Decide where to place each grouping, according to where you'll use them most often. For example, store cookware next to the stove, dishes in close proximity to your dishwasher, utensils within your prep area, and items such as coffee filters and mugs, near your coffee maker. Placing items where you need them saves time and energy, increasing the functionality and flow of your kitchen. Rather than tossing items like sauce packets, spices, or other small items directly on shelves, group them together in clear plastic containers. The clear design allows you to easily see what you have on hand, while the containers themselves keep things organized and neat. Step 5: Keep a lid on it. Before returning them to your cupboards, match up each storage container with a lid. Relegate those that don't have a match to other areas of your home where they may be needed, or discard or recycle. Group containers according to size, and place lids in a clear container or box of their own, standing on their sides for easy access and visibility. Custom window shades from Polar Shades can help complete the look of your newly organized kitchen, and add to its style, and functionality. When you're ready to install shades in your home, give us a call at 702-260-6110, to set up your free, in-home consultation.